South Africa President Cyril Ramaphosa will be the Chief Guest at the Republic Day Parade 2019. 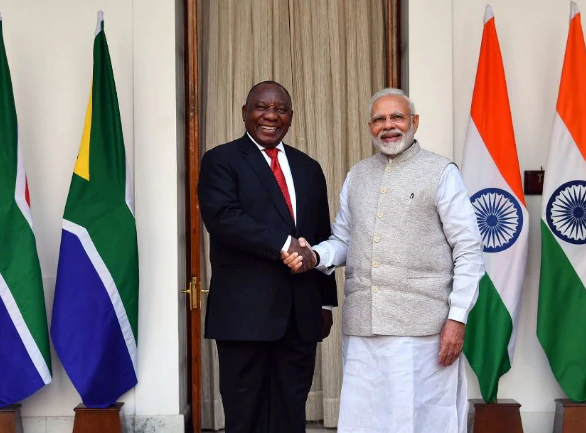 To grace the celebrations, South African President Cyril Ramaphosa accompanied by first lady Dr Tshepo Motsepe and a high-level delegation including nine ministers, senior officials and a 50-member business contingent will have a two-day India visit. It will be Ramaphosa’s first India tour as the head of the state. He is the second President of South Africa after Nelson Mandela to be the Chief Guest at the parade. In 2018, leaders from the 10 ASEAN nations – Thailand, Vietnam, Indonesia, Malaysia, the Philippines, Singapore, Myanmar, Cambodia, Laos, and Brunei – were the chief guests at Republic Day celebration. On 26th January 2019, India will celebrate its 70th Republic Day. First Republic Day of India was celebrated in 1950. 2019 celebration will be special as this year will mark the 150th birth anniversary of ‘Father of the Nation’. Around 17 tableaux from states/Union Territories and 6 from various ministries will be displayed in the parade based on the theme ‘Gandhi’. Republic day in India is celebrated every year with great pride on 26th of January to honour the Constitution of India as it came into force on the same day in the year 1950. For the first time, four veterans from the Indian National Army (Azad Hind Fauz ) of Netaji Subhash Chandra Bose will take part in the Republic Day parade at Rajpath. India ranked at 80th positions on the Global Talent Competitive Index (GTCI) 2019. The index is released by INSEAD business school in partnership with Tata Communications and Adecco Group. Switzerland topped the index which is followed by Singapore and the US. According to the report, India's biggest challenge is to improve its ability to attract and retain talent. The report measures levels of Global Talent Competitiveness by looking at 68 variables such as ease of ease of hiring, gender earnings gap, and prevalence of training in firms. The Reserve Bank of India (RBI) has approved the appointment of Ravneet Gill as the MD & CEO of private sector lender Yes Bank. Gill must join the bank before March 1, the central bank has said. Gill is currently the India chief of foreign lender Deutsche Bank. He will replace present MD & CEO of Yes Bank Rana Kapoor whose term ends on January 31. Gill, joined Deutsche Bank in 1991 and became its India CEO in July 2012. According to the UN's World Economic Situation and Prospects (WESP) 2019, India's GDP growth is expected to accelerate to 7.6 percent in 2019-20 from an estimated 7.4 percent in the current fiscal ending March 2019. The growth rate may come down to 7.4 percent a year later. India will continue to remain the world's fastest-growing large economy in 2019 as well as in 2020, much ahead of China, a UN report said. In the case of China, the growth is estimated to decelerate to 6.3 percent in 2019 from 6.6 percent in 2018. It may further go down to 6.2 percent in 2020. The report further said the global economy would continue to grow at a steady pace of around 3 percent in 2019 and 2020 amid signs that global growth has peaked. The International Monetary Fund (IMF) projected India’s growth at 7.5% in 2019-20 amid slower global expansion. According to the Crisil Ratings, India's growth rate is likely to inch up to 7.3 percent in 2019-20. India is expected to clock a growth rate of 7.2 percent in the current financial year, up from 6.7 percent in 2017-18. "In fiscal 2020, Crisil expects GDP to grow 7.3 percent on assumptions- normal rains, oil prices lower than 2018, stable political outcome," the rating agency said in its 'India Outlook FY20'. It said the current account deficit (CAD) would reduce to 2.4 percent of GDP in fiscal 2020 from 2.6 percent in fiscal 2019. Private sector Lakshmi Vilas Bank has reappointed Parthasarathi Mukherjee as its managing director. He will hold the position another two years from January 25. Mukherjee joined the bank on January 25, 2016, for three years and had brought positive changes initially before the piling up bad loans hit profitability. Today, India is celebrating National Voters Day across the country. This year, India marks the 9th edition of the National Voters Day. The National Voters Day is celebrated all over the country on January 25 every year. The Indian Election Commission was set up on January 25, 1950. Therefore, since 2011, it has been decided to celebrate National Voters Day on this day. The day is celebrated especially to make young voters aware of voting and political response. In view of the upcoming Lok Sabha Elections, ‘No Voter to be Left Behind’ has been selected as the theme for the National Voters’ Day. A quarterly journal, My Vote Matters, will also be launched in this program. Today Himachal Pradesh is celebrating its 49th Statehood Day. On 18 December 1970 the State of Himachal Pradesh Act was passed by Parliament and the new state came into being on 25 January 1971 making it the 18th state of India. S. Parmar became the state’s first chief minister. While congratulating the people of the state with full State Day, the Chief Minister Jairam Thakur said that unprecedented development has taken place in the state during the last 48 years. This development has been possible due to the active cooperation and cooperation of the people of the state. Prime Minister Narendra Modi launched the ‘Pravasi Teerth Darshan Yojana’ under which a group of Indian diaspora will be taken on a government-sponsored tour of religious places in India twice a year. Prime Minister Modi, also inaugurated the Centers of Excellence at Deen Dayal Hastkala Sankul in Varanasi. He also released two books – 'Kashi: The Universe of Crafts and Textiles' and 'Indian Textiles: History, Splendour, Grandeur'. All people of Indian-origin aged 45 to 65 can apply and a group will be selected out of them with first preference given to people from 'Girmitiya countries' such as Mauritius, Fiji, Suriname, Guyana, Trinidad and Tobago, and Jamaica. The tour would be completely government sponsored, as the government will bear all the expenses including the airfare from their country of residence. Krishna Sobti, a legendary Hindi writer, passed away early this morning in Delhi. She was 93. Born in February 1925 in Gujarat- Punjab, now a province in Pakistan, Sobti began her writings in poetry and then went on to write fiction which won her several awards. Sobti was awarded the Sahitya Akademi Award in 1980 and the Jnanpith award in 2017 for her contribution to Indian literature. In 2018, she released her autobiographical novel — ‘Gujarat Pakistan se Gujarat Hindustan’. Botha's Australian Twenty20 league team, the Hobart Hurricanes, announced the news. The 36-year-old Botha, who received his Australian citizenship in 2016, failed to take a wicket during nine-wicket loss to the Sydney Sixers. The joint training exercise is being conducted with more than a dozen African countries & India. It aims at synergizing humanitarian mine action and joint peace operations. The IAFTX-2019 is a positive step towards growing political and military ties with the member nations of the African continent and will boost the already strong strategic cooperation between the countries.